The color combination of navy and white seems so crisp and clean for spring. The embroidery and poms on these shorts are so fun and a bit different! I paired them with this ruffle top for dinner outside with David earlier this week. I love taking advantage of these warmer spring temps and balmy evenings. David has been getting off work a little earlier than usual. I love when we have “real American” days. The other night he was home at 5:00 and I actually cooked dinner. We were watching a show and I said “this is how most of America lives… and it’s amazing!” haha I am definitely “over” the residency gig. Even though David is technically finished with that part in a few months, the 3 year fellowship isn’t supposed to be that much better… Mur Mur… everyone told me that it would be a long hard road, but I don’t think I knew just HOW long and HOW hard – and I’m not even the one doing it. Still, I’m excited for the next chapter coming up and moving closer to family and being back in the south. Anyway… I’m trying to slowly but surely get some summer outfits together for some upcoming travel. David has some time off in May and I’m going to the beach with my family! I’m also headed on a blogger trip in June and there’s a Senior retreat for David’s residency class coming up on the horizon as well! It’s going to be a great spring. Hope you have a happy hump day and thank you so much for reading! 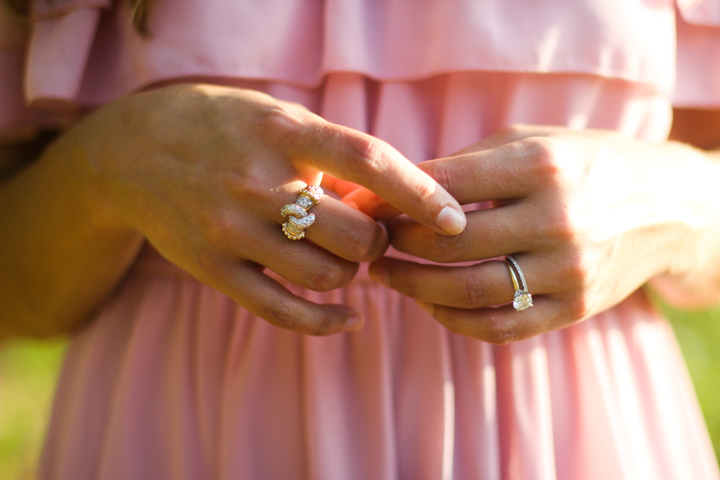 We (Jenna Kutcher and I) went to Kitty Hawk this past weekend to shoot a wedding! It was so much fun getting to be her right hand gal and learn some of her amazing photography knowledge. The beaches were beautiful and I hope this post transports you back to your beach or wherever you spent your vacation weekend. 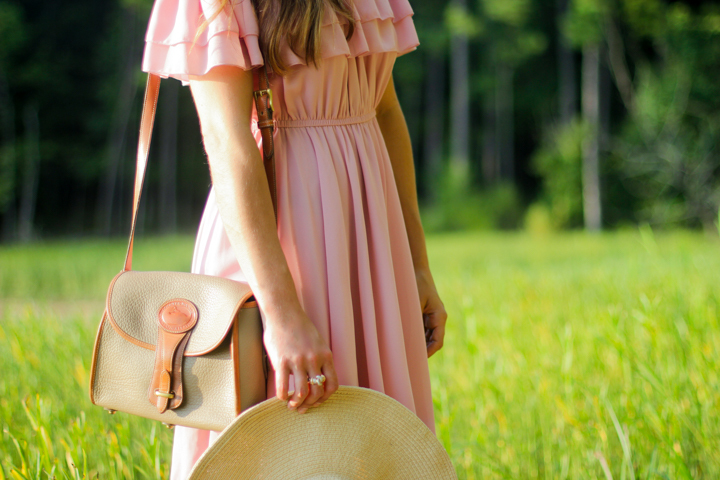 Between this ring and these light pink ruffles I’m definitely feeling feminine and ladylike. I usually don’t go for romantic girly dresses.. but everybody needs a pretty pink dress every now and then. Plus, we were in the Outer Banks beaches – aka – where Nicholas Sparks novels are set, so this dress really seemed to fit the bill. I halfway expected to see Channing Tatum walking out from behind a sand dune. I wish David could have gone with us but he had to work a 30 hour shift Friday morning to Saturday afternoon. I digress.. on to dress talk: The off the shoulder trend is back in a big way and I’m not opposed at all. I think shoulders are a much more appropriate and becoming part to show off versus the stomach cut out trend – just couldn’t pull that one off, nor did I really want to. Sometimes I just have to say: that is for a 17 year old. Or: I hate that trend. I think fashion is all about wearing whatever makes you comfortable and happy … and for me sometimes that means saying no to the latest and greatest trend. This dress reminds me of a lot of things – being a ballerina, the emoji of the salsa dancer, and the pink dress I used to dream about from Sound of Music. Isn’t it Nate in Gossip Girl whose favorite movie is Sound of Music? haha … Ahhhh classic.